To get to this page, to to Reports → SMTP Server Status. This report shows you a summary of recent activity to the VPOP3 SMTP service. This is for both incoming and local SMTP sessions. •Sessions - this is the number of SMTP sessions which were started during the displayed time period. 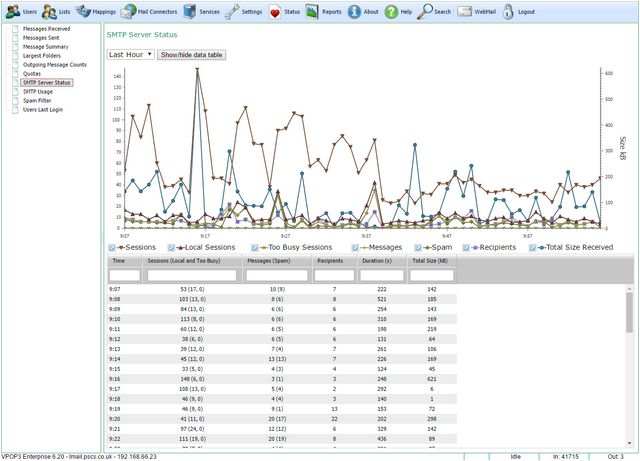 •Local Sessions - this is the number of SMTP sessions which were made from local IP addresses. •Too Busy Sessions - this is the number of SMTP sessions which VPOP3 ended because it was too busy (as configured on the SMTP Service Load Limiting tab). •Messages - this is the number of messages sent through the SMTP service. •Spam - this is the number of messages which VPOP3 detected as spam. •Recipients - this is the number of recipients which VPOP3 was told to deliver messages to. •Duration - this is the total time in seconds that the SMTP service was processing messages for. •Total Size Received - this is the total size of messages. This report does not require Historical Logging to be enabled, but can only display data for up to the last week. The graph is 'active'. If you hover the mouse over a data-point on the graph it will display the value at that time. You can use the scroll-wheel on your mouse to zoom in and out on the date axis, and, when zoomed-in, you can drag with the mouse to move the graph around. Below the graph is a table of data grouped by date. You can show or hide the table by clicking the Show/hide data table button.